But don’t overlook the possibility of having a good time once the sun goes down. By exploring the local clubs and bars, you’ll get the chance to interact with local citizens and fellow tourists alike. You’ll probably catch on to some new musical tastes, as well. If you’re traveling to Spain, the Costa Blanca nightlife has lots to offer. So, save some energy from your daytime adventures and prepare to spend at least a few nights on the town. The most thriving nightlife can be found in Costa Blanca’s most populous towns. Near the Alicante marina area you will discover a stretch of very posh bars that overlook the yacht-filled harbor. Think about grabbing a cocktail at 4Gats, a popular jazz club. 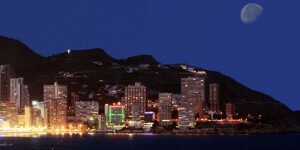 The Levante Beach district in Benidorm is famous for having some of the most raucous clubs in all of Costa Blanca; KM boasts a sprawling dance floor complete with elaborate laser shows. Meanwhile, if you explore Altea’s “Old Town” district, you should encounter a number of classy, high end bars that echo the sophistication of the town’s cobblestone streets and ancient architecture. Costa Blanca nightlife may not be quite as vibrant as it is in some of the more bustling Spanish cities, like Madrid or Barcelona. But there’s a certain cultural charm that surrounds so many of the establishments in this eastern region of the country. Don’t miss out on the chance to enjoy the company of some Spanish citizens and a host of international tourists over some good live music and a tasty beverage.